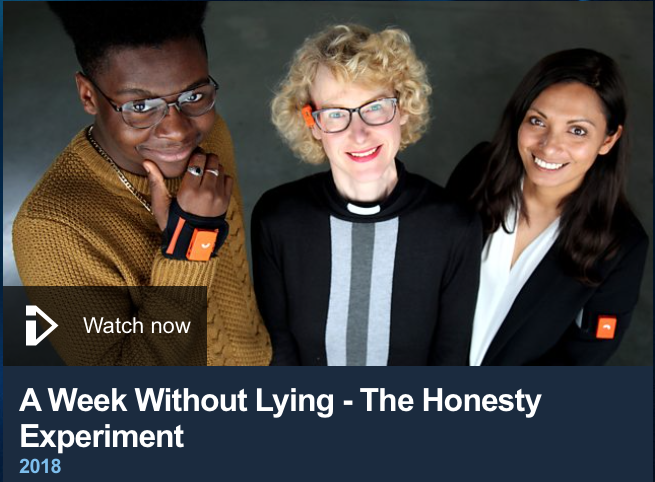 Horizon’s ‘A Week Without Lying’ was billed as the first to explore if we can live without deception. But while it highlighted the linguistic, physiological and physical changes that one undergoes while lying, it is only the crack in the ice for research in this field. ‘Lying by omission’ and the need for deception in daily life were explored fruitfully. We saw its significance in social media, relationships and working life. There were echoes of psychological findings, such as evidence (from Matthew Newman, James Pennebaker and others) that liars are less likely to use self pronouns and are more likely to avoid going into detail. However, there are always exceptions: one participant in this programme found it easier to go into excessive detail when lying. Perhaps this has developed out of habit; this particular teenager’s social media persona was a strong alter ego. The programme demonstrated the mental effects of truth telling, and how easy it is to lie (including by omission or white lie). Yet the really bad, consequential lies were something of a postscript; and I can’t help but wonder if the issue of why we lie and who it actually serves should have been to the forefront. But it seems clear it is not possible to be completely honest all of the time, and perhaps this programme may lead to viewers taking an interest in the science of deception that goes beyond the work of Paul Ekman. The programme featured expert input from Paul Taylor, Gordon Wright, Sophie Van Der Zee and Ronald Poppe.